This article refers to the latest XLCubed version. For other versions, see Cube Comments/Versions. 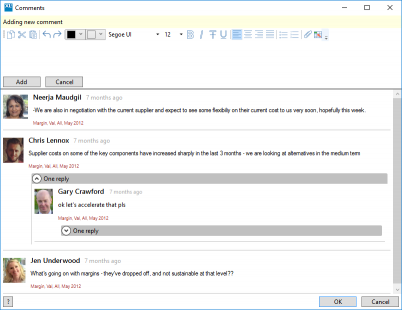 Cube commentary allows authorised users to enter and view text commentary or analysis against specific data elements. Comments can be made for a specific data point, or at higher levels of the data, for example an entire month. Commentary was introduced in Version 8.1, and significantly extended in Version 9.1. It requires access to XLCubed Web Edition running in SQL Repository mode. By default, comments are not displayed or enabled in Grids. They are enabled in the Commenting section of the Grid Properties ( XLCubed > Properties > Commenting ). Once enabled, any users of the reports can view and enter comments depending on their level of access. 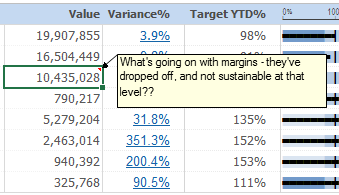 Comments are displayed in the same way as Excel comments as shown below. 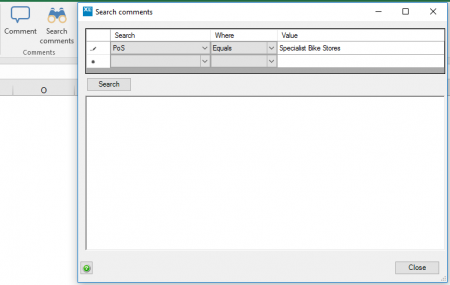 The comments are linked to specific data points rather than specific Excel cells. For the fully formatted timeline view of the comment, click on the cell and select the "Comment" grid ribbon item (this is also on the right click menu). This dialog also allows new comments to be entered. Additional comments can be added to the same datapoint and will be shown in a timeline view, and users can also enter replies to specific comments to form a discussion thread. Comments can be highly-formatted, and can include content pasted directly from Word. Comments can also incorporate file attachments or screenshots taken from the current Excel workbook using the icons highlighted below. If you are set as a "Comment Admin" you can delete and edit any comments, otherwise with normal "Comment Entry" access you can only edit and delete comments created by yourself. These options appear when you hover over an existing comment, as shown below. History shows the ownership and timing of any changes which have been made to the initial comment. Within a report, comments will appear as a red indicator on the relevant cell(s). You can see the comment itself when hovering over the cell, and then choosing comment from the menu. In many cases it can be useful to have the relevant comments fully visible on the report. In other cases you may want to report purely on the comments themselves to see all comments entered for specific aspects of the data, for example all comments relating to a specific product, a specific time period, or in the last 24 hours. 1) Tied to a specified Grid, where they display all comments for the Grid, filtered by the current selections in place. 2) Tied to an Excel range containing uniquenames. Typically this approach would be used to display either higher level comments, or to build a report directly on the comments users have entered. Comment frames are added from the Visualise menu. See Comment Frame for more details. XL3CubeComment - Can display and allow comment entry for a particular cube slice. This can be combined with slicers to allow comments to be based on the "Current View" of a report, or without any Hierarchy/Members to provide a general workbook comment. It is possible to override this behaviour and restrict the comments visibility to either a specific workbook, or group of workbooks. This is the 'Limit Comments by Key' setting in XLCubed - Options - Workbook Options, and in the workbook group. Enabling this creates a custom key for the workbook, which you can override with a common key if you want the same comments to be shared across several reports, but not all report, e.g. 'Budget Q417'.